Leicester City striker Jamie Vardy has been given a "substantial" fine and ordered to undergo diversity awareness training by the club after claims he made a racial slur in a casino. The Sun on Sunday published a video allegedly showing Vardy abusing a Japanese man on Sunday, 26 July. After investigating, Leicester opted against sacking Vardy, 28, after taking into account his "prompt apology". "Jamie has been reminded of his responsibilities," said the club. The Foxes added Vardy's fine would be donated to local charities. As he apologised "wholeheartedly" on Sunday, Vardy said he made "a regrettable error in judgement" and accepted his "behaviour was not up to what's expected of me". Tom Hopper, Adam Smith and James Pearson - the son of former Foxes manager Nigel - had their contracts terminated after an investigation by the club. Claudio Ranieri, who succeeded Pearson Sr as Leicester boss, said: "Jamie has apologised and for me it is OK.
Referencing the club's Japanese striker Shinji Okazaki, Ranieri added: "There's a good relationship between Jamie and Shinji. We go only forward." Former Fleetwood forward Vardy scored the first goal in Leicester's 4-2 win against Sunderland on Saturday, the opening day of the Premier League season. 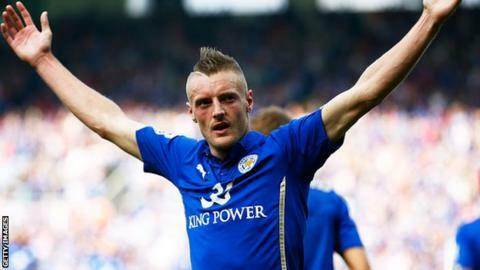 He has netted 26 goals in 98 league games for the Foxes and made his debut for England in June.